It's perhaps a bit of understatement to call a book involving a high-speed undersea train heist a "down" trade, but it feels like Green Arrow Vol. 2: Island of Scars rests on its laurels after the first volume Rebirth premiere. Perhaps I need to adjust my expectations; after all, when this title's already done a year's worth of stories in six months due to weekly shipping, maybe there's more time for "just because" stories. If anything, writer Benjamin Percy emphasizes here the Green Arrow/Black Canary relationship, which I find fascinating and problematic all in one. Percy also explicates John Diggle's role in the Rebirth "Team Arrow" and also introduces a blast from Green Arrow's (previous continuity) past. 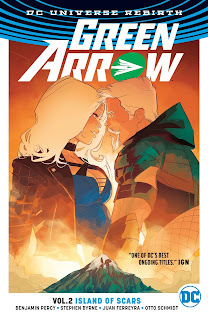 But it's hard to see how the Green Arrow story so far would be much different without these issues, nor does this book definitively suggest where the Green Arrow title is going from here, and the result is a trade that doesn't quite feel complete. The uncertain nature of Island of Scars is evident from the start, in a two-part story starring Green Arrow Oliver Queen's little sister and sidekick Emiko. As Emiko is abducted and off-camera for most of this book, it's narratively fitting that Percy gives her a role even if in flashback. However, when the trouble surrounding Emiko at present is that she betrayed Oliver to his enemies, a flashback story about another time Emiko betrayed Oliver comes off discordant rather than harmonious. The audience learns this so soon after the "first" betrayal that it seems strange the characters wouldn't have referenced this themselves. There's also an element of the supernatural to Emiko's story that I don't think quite fits Green Arrow, so that bothers a bit as well. Percy splits the book into three two-issue stories, reflecting the three two-issue months this book collects, even though really the entire last four issues involve Team Arrow's escape from the titular island. In this way too the book's structure is discomfiting, as the much-vaunted "Island of Scars" story really only spends one issue on island introspection and then three issues on bad-guy fighting and train hopping. Most confusing is the conclusion, in which Oliver and Black Canary Dinah Lance come speeding out of a trans-pacific tunnel on motorcycle to announce to the gathered crowd, "We're back!" The implications are murky: in Rebirth continuity, what does Seattle know about Green Arrow? Will they be glad he's back? Did they even know he was missing? The cliffhanger falls flat, and whereas it wouldn't be such a big deal were the next issue two weeks away, Island is all build-up and no payoff when the next collection isn't until August. The Green Arrow franchise has a long history of important moments involving Oliver stranded on a deserted island, and Island of Scars was purported to involve that plus Percy's so-called "sexiest story ever." Again, the island material is really limited to just one issue, and while Otto Schmidt's artwork is attractive (among the best of Rebirth), I'm not quite sure the issue earns that superlative. As has been the case, Percy emphasizes how much better of a person Dinah makes Oliver to the point of silliness ("Having you here with me," he says, "I feel like I can think again. Like I'm whole again."). I hope Rebirth's main story will reveal the previous connection between Oliver and Dinah such that her presence really does clear his mind in a psychic-type manner; as it stands we have two people who've only just started dating but who seem obsessed with one another in a way that doesn't totally bring the reader along. In this way, Percy's motivations for Oliver are sometimes all over the place. Stranded momentarily alone on the island, Oliver thinks that "without Dinah, and Emi, and Diggle, I'm no one," which is nice but doesn't make a lot of sense given he just started working with Dinah and John Diggle, and had plenty career before Emiko. There's an exceptionally strange moment where Oliver needs to hop a speeding train but turns back for his bow, claiming "it's all I have left in the world," and neither Percy's writing nor Juan Ferreyra's art makes it clear if this is serious or a jest; if Oliver's that devoted to that particular bow, we don't know why. And the end of the book becomes about Oliver trying to preserve his father's legacy through the Trans-Pacific Railway, a development that comes about suddenly; here, too, Percy hasn't done enough independently to describe or demonstrate Oliver's relationship with his father for the reader to understand what's at stake here. It is interesting to read Island of Scars just after binge-watching television Arrow episodes "Kapiushon" and "Disbanded." As well as Arrow has tried to reflect the feel of Mike Grell's Green Arrow stories specifically, it remains that "Arrow as murderer" is somewhat original to the show, much ballyhooed in those two episodes; comics' Green Arrow generally didn't kill and much was made of it when he did. There's a notable moment in Island where Oliver considers killing main foe Broderick and Dinah talks him down from it, with the implication that this Oliver hasn't killed or doesn't do it much (Rebirth having apparently done away with Justice League: Cry for Justice, for the moment at least). I appreciate that Ben Percy keeps a sense of "social justice" in Island's conflicts, but it gets too complicated after a while. A major shipment of heroin being sent to Seattle is riding on the same underwater train as a junket of international diplomats, one of whom Broderick has hired an assassin to kill because war promotes Broderick's business interests; putting it all under the heading of "predatory business," as Oliver does, doesn't quite smooth it out. I did appreciate that said assassin is Eddie Fyers, now returned to Green Arrow lore, though as I first encountered Fyers in Chuck Dixon's Green Arrow run where he was a good guy, I always have trouble accommodating myself to Eddie Fyers, villain. In all of these ways (and the fact that Dinah, undercover, feels the need to modify a stolen dress to put a canary symbol on it), Green Arrow Vol. 2: Island of Scar is an uneven read, not quite as strong on its feet as Green Arrow Vol. 1: The Death and Life of Oliver Queen. That said, Benjamin Percy's Green Arrow is often weird but never bad, and I like what he does with these characters even it doesn't always hold up in the fine details. That Otto Schmidt draws a majority of the next book is a big incentive to come back next time, too.